Switch to natural gas • Firm to gain more electricity; valley residents to breathe easier. FRANCISCO KJOLSETH | Tribune File Photo Kelly Sanders, President and CEO, of Kennecott Utah Copper recently announced the company's plans to significantly reduce emissions and improve the air quality in the Salt Lake Valley as part of the mine's proposed expansion. Kennecott Utah Copper announced plans Wednesday to revamp energy generation at its refinery  a change that will mean more electricity for the company and cleaner air for everyone in Salt Lake Valley. "As a mining company, we're well aware that our activities disturb the land, create waste products and use energy resources," said Kelly Sanders, company president and CEO. "We're committed to reducing these environmental impacts as much as possible." The company will retire three coal-fired plants and replace them by 2014 with a gas-fired plant that not only generates electricity but also captures and uses waste heat. Kennecott will gain 100 megawatts of new power, while dramatically reducing pollutants at the company's refinery, located near the southern edge of Great Salt Lake. The proposed changes, which require state approval, would reduce Kennecott's overall air pollution by 20 percent. Eventually, the company plans to invest in at least one more of the combined natural gas units. The $20 million in changes will have the same pollution-reduction effect as removing one of every 10 cars from the road. And they will allow the company to generate its own electricity year-round, rather than having to go out to the energy markets each winter  from November through February  when it shuts down the coal-fired plants to reduce pollution. A combination of less pollution and more energy is key to the company's plans to extend Bingham Canyon Mine's life to 2034. If Kennecott receives regulatory approvals and opts to move forward with the expansion, the open pit's south wall would be pushed back by about 1,000 feet and deepened another 300 feet. Doing so would allow the company to reach another 700 million tons of ore.
Rocky Anderson, Salt Lake City's former mayor, voiced his support for the environmental improvements at a news conference announcing the power plant changeover. Now head of a human-rights organization, Anderson praised Kennecott for tackling pollution and climate change. "Those who maintain that we can't grow our economy and our industrial output without an increase in pollution," he said, "should pay heed to what Rio Tinto [Kennecott's parent company] is doing in Utah." Regg Olsen, who oversees air-pollution permits for the Utah Division of Air Quality, said Wednesday he hadn't yet seen the company's application for the coal-to-gas changeover. His office will check the firm's request against a kind of airshed-wide pollution allowance the state has agreed to with the U.S. Environmental Protection Agency. Salt Lake and Davis counties face a crackdown on at least three key pollutants: ozone, PM 2.5 and PM 10. Olsen called Kennecott's proposal "huge." 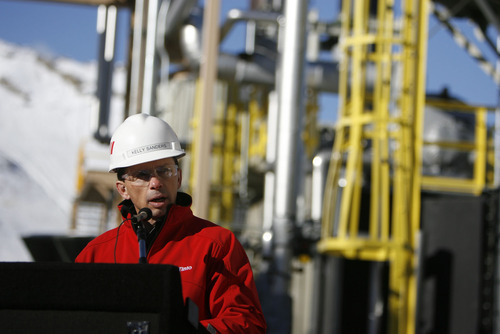 "Natural gas is a much cleaner fuel," Olsen said. By using it, Kennecott is paving the way for "a significant reduction of pollution." Utah's environmental community has been meeting with company officials for six months on the mine extension and the associated increases in dust, air pollution and mine waste it's expected to bring, and representatives issued a joint statement Wednesday praising the company for reducing the use of coal at what they described as the largest stationary, industrial source of air pollution in the valley. "Any such measure," the statement said, "is a very positive move towards cleaning up the continual air-pollution problems in our community, and also a significant reduction in greenhouse-gas emissions" that contribute to climate change. But the groups  Utah Physicians for a Healthy Environment, Utah Moms for Clean Air, Post Carbon Salt Lake, Utah Chapter Sierra Club, Breathe Utah, Peaceful Uprising and Renewable Energy Resources  also criticized the company for not eliminating all coal use, including that in a boiler built 50 years ago that can use coal or gas. The extension will "most likely add additional amounts of pollutants into our airshed" and will not meet an "urgent need to reduce greenhouse-gas emissions as quickly as possible."